One of the most anticipated launches in years was Boards and More GMBH’s change of branding from North Sails to Duotone – wait no more as it is here! 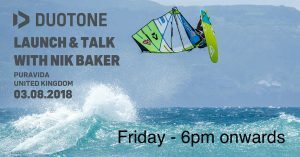 To kick things off we invite you to join us for an evening with long time brand representative Nik Baker on Friday 3rd August from 6pm in the Puravida Store. 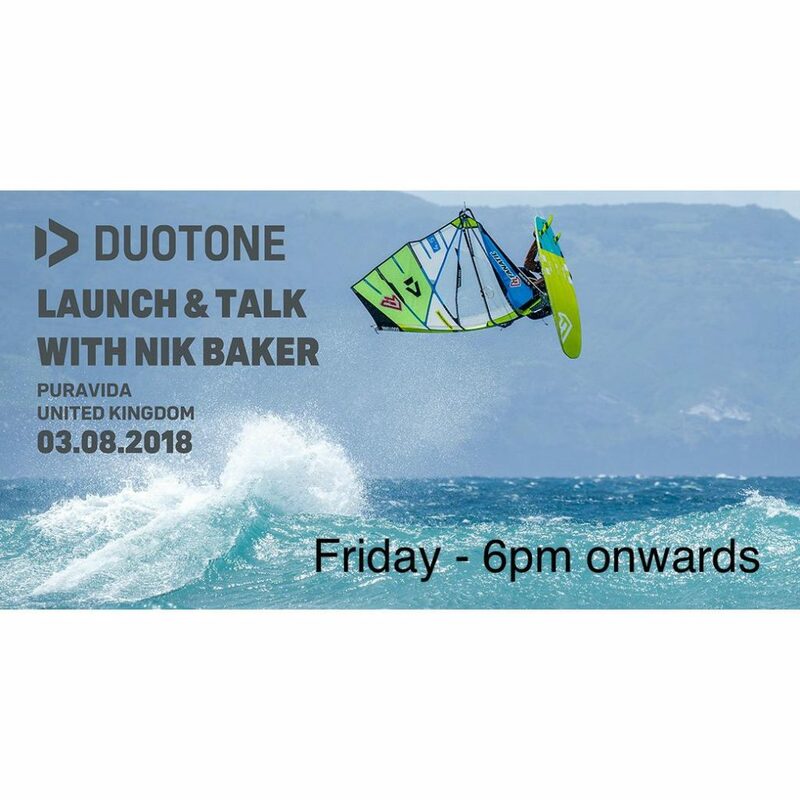 Nik is widely regarded as the best wave sailor the UK has ever produced, with 3 x Vice world championship wave titles under his belt, and now running UK distribution of Duotone, Fanatic and ION – who better to hear about the new range of kit from?! 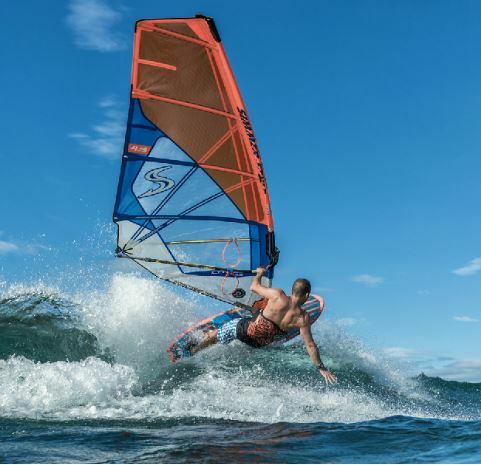 He will talk over sails like the Super Hero, Super Session, E-Type, F-Type and more, aswell as the new 2019 Freestyle and wave range of boards from Fanatic. Nik Will be on hand to talk through the new kit aswell as answer any questions you might have for him about it, and we will also have our fleet of demo kit in store should you want to try any of it off the back of what you hear. Bring a drink or two with you, we’ll supply Pizza from the excellent Tony’s taste of Italy so there really is no reason not to come along! To get the initial low down on the range, follow the link below to learn more, and swat up with any questions you might have! Well what can we say, our last litter pick has caused quite a stir! 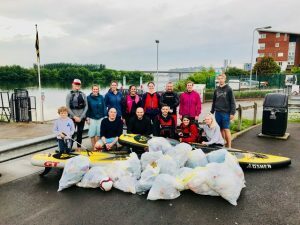 To follow on from our last litter pick when we were inspired to ‘turn the tide on single-use plastic’ we will be helping to clean the river Taff again and collect as much recyclable rubbish that we can along with the support of BBC Wales X-Ray programme and special guest paddler Lucy Owen. 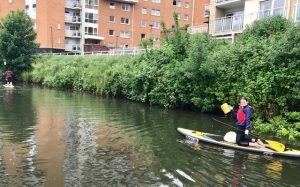 By signing up to take part in this special club night paddle, you agree that the BBC can film the occasion and may choose to use any footage that you may feature in to broadcast both on TV and online. 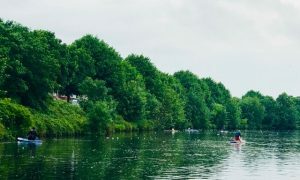 This evening is free of charge, is open to club members and non club members BUT you must have previous paddle boarding experience. What to wear: Please make sure you have suitable footwear to use on the water. If you are a regular paddle boarder please wear what you are most comfortable with and bring a change of clothes. FOR THIS EVENT ONLY, WE ARE MEETING ON WEDNESDAY July 11th ready to launch at 18.15 in the evening from Channel View leisure centre. 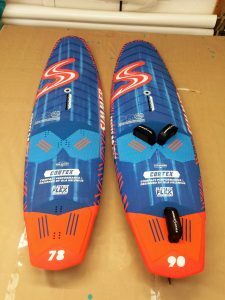 RB SAILS are really lucky to have got some of the first Simmer Cortex boards in the UK so we thought it would be good to write a little report on it and compare it to the Fanatic Stubby that we had access to last year. The Simmer Cortex 78 and 90 arrived and the first thing we have to say is how well packaged they were! The boxes were double thickness and there was good foam and extra protection. It might seem a funny thing to say but I think it is important given the number of stories of damaged in transit boards. The next thing that we noticed was how beautifully finished the Cortex is. It looks to our eyes absolutely brilliant. If you don’t like blue and orange then it isn’t for you! The fins look and feel excellent. They are super light so it will be interesting to see how well they last. The straps look pretty standard, but I would have preferred them in orange! I have a lot of experience with this style of board having been riding my own shapes since 2012 (I think), so it is interesting to try other people’s take on it. I used the 78 ltr Simmer Cortex for the first time the other day in gusty 5mtr weather (No action shots as it was too early, to rainy and no one wanted to take any). So, although I probably have a bit more to learn about it, I must say that I was very happy with the way it performed straight away. It gets on the plane quickly especially with a couple of pumps. It was really comfortable riding around. The Cortex gybes really nicely and keeps its speed well, and this is clear in the bottom and top turn too although the waves were pretty average. It absolutely flies and the speed it maintains is great so jumping is really good. I’m looking forward to some more constant winds to really push the jumping. I have also used the Simmer Cortex in very light cross off drift and ride conditions. It truly excelled. The volume being evenly distributed meant it was stable to drift out and it picks up waves very easily. The bottom turn felt great, totally secure and the tightness of turn is adjustable and that was with the fins not in the loosest position. The top turn was sharp and responsive. So, I can’t really think of many negatives about this board. It is so easy to sail and does everything well! BUT how does it compare to my old board and more importantly how does it compare to Fanatics trendsetter, The Stubby. I got hold of The Stubby as I needed a replacement for my own shaped board that was starting to give up the ghost, and I am a big fan of the concept. Now, I have to say that the Fanatic Stubby is a fantastic board and I would say that everyone could benefit from this board. It planes very quickly ( a customer has one and it gets going quicker and more often than his larger board) and is super fast. I would say it probably has a very slight edge over the Simmer Cortex in early planing and probably maintains that through the lulls slightly better too. Top speed is similar. Comparing them to my own shaped board I would say they were all in the same ballpark. One thing I found slightly uncomfortable about the Stubby was the mast track position. Even with it at the very back of the box it felt too far forward for me. Maybe this is something to do with the overall length when compared to my board which is 199cm long versus 214 for the Stubby and 213 for the Cortex. The Stubby is great for jumping as it flies everywhere and felt nice and smooth when landing. The Stubby can also gybe itself which is a joy, and this translates to a nice bottom turn. However, I did struggle with the top turn sometimes. For me the Stubby would snag on the lip unless you hit it just right and I think it felt a little stiff when compared to my home brewed shape (which to be fair is a pretty wild board to ride!). I would say the Cortex has a more snappy turn and I definitely preferred it on the wave. This is not to criticise the Fanatic as it is an exceptional board as Adam Lewis shows. These shapes are great. You can ride a smaller size than traditional boards as they plane so well. The Fanatic Stubby planes very slightly quicker than the Cortex but top speeds are the same. On the wave the Cortex feels right between my home made board and the Fanatic, where the homebrew is super loose and lively and the Stubby is bit more safe. Because of this and living in Cornwall I choose the Cortex, with it’s edge in the wave riding department. 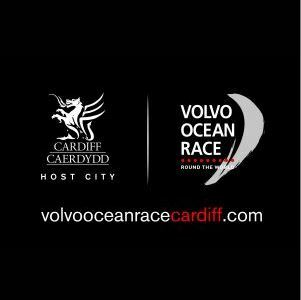 With the Volvo Ocean Race currently in Cardiff, we decided to take the opportunity to team up with their Turn the Tide on Plastic Scheme, Penarth View and the SUP South Wales club to do a litter pick on the River Taff. 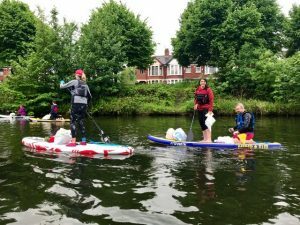 When we turned up we were in shock by the sheer volume of rubbish in the river, with plastic bottles, balls, bike wheels, pipe cladding and all sorts of other junk. For more Pics/videos and info on the paddle and any future events check out the following Facebook pages, and be sure to give them a follow! 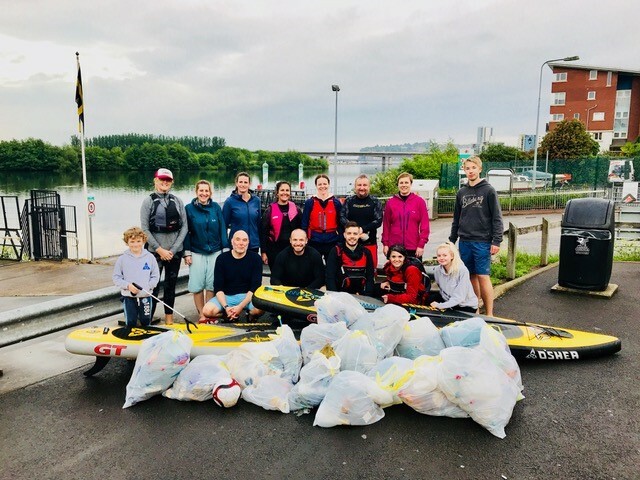 “I have to say a huge thanks to everybody that supported our ‘Litter Pick’ on the Taff last night inspired by the Volvo Ocean Race – ‘Turning the tide on plastic’! It was a great SUP South Wales Paddleboarding Club crew supported by Penarth View & Puravida Boardriders ….. another thanks to Andy, who kindly helped us take the bags away in the rowing club boat and the fantastic Harbour Authority staff at Channel View for providing the recycling facilities from there! Sad to see, but if we all do a little to think about single use plastic, recycling and spreading the word hopefully this will change in time! O’Shea GTE Touring Board – REVIEW!!! Check the latest review of the awesome Oshea GTE touring board! 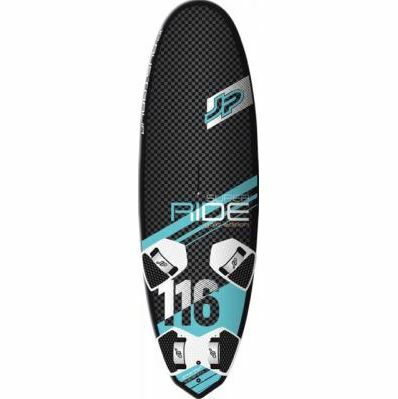 Available to test drive, view & buy at Puravida Boardriders or on one of our local club night paddles!!! 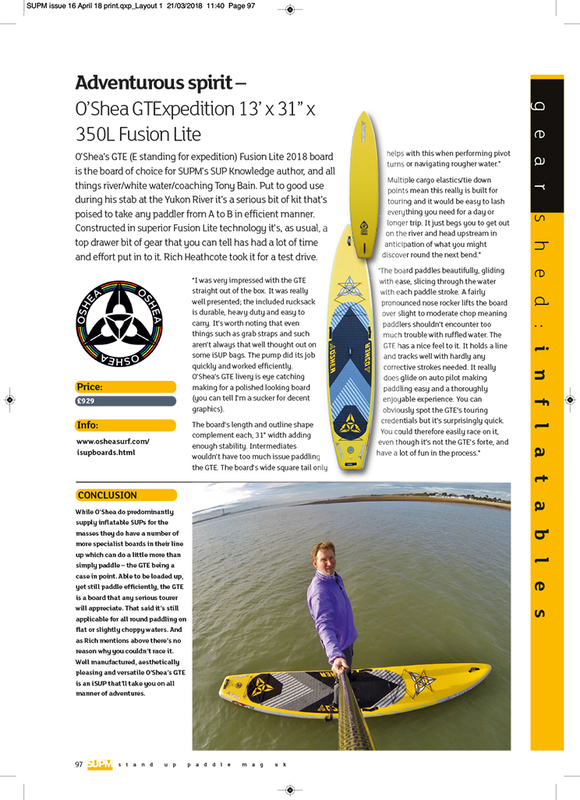 The Ultimate in Exploration SUPing ! 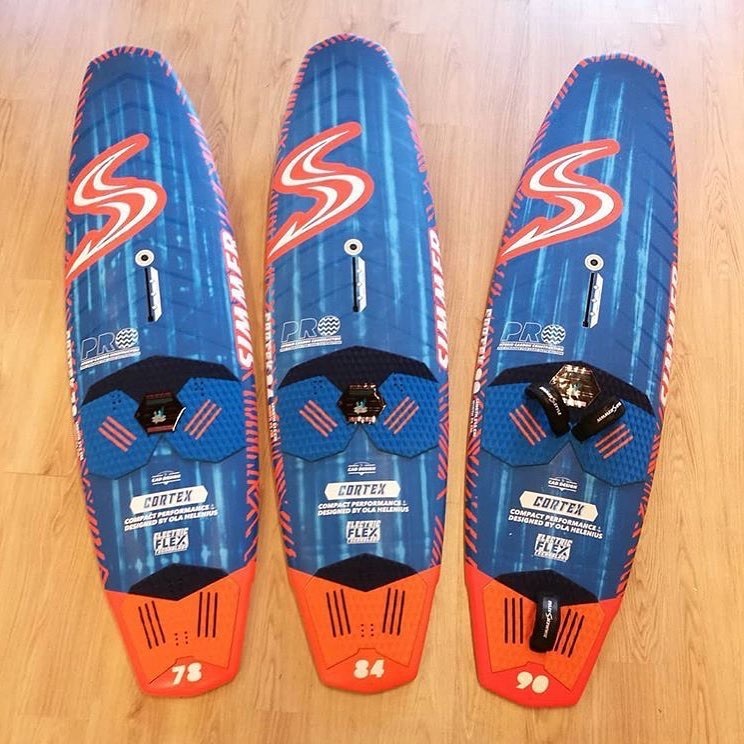 Whether your on a sunny afternoon paddle or an epic voyage ,this board brings out the hidden explorer in all of us …..
O’Shea HP series are a convergance of both High Performance and Lite weight fabrics ! The Pre- laminated outer PVC has a weight saving of approx 20% over more traditional SUP constructions ,with almost NO loss of torsional or longitudinal stiffness . Don’t however confuse this Material with many brands that use the word “Fusion” – albeit they have a fused outer their internal drop stitch thread is often of poor tensile strength ! Size for size , not only is this Light ,it also rolls up smaller – WIN WIN !! 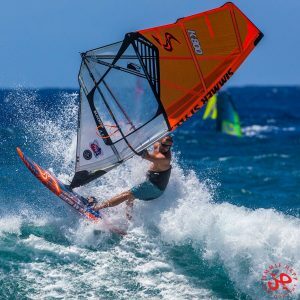 Here at Puravida we have been having a bit of a spring clean, and as such we are having a Simmer Clearance on some current stock of Windsurf Boards and Sails. 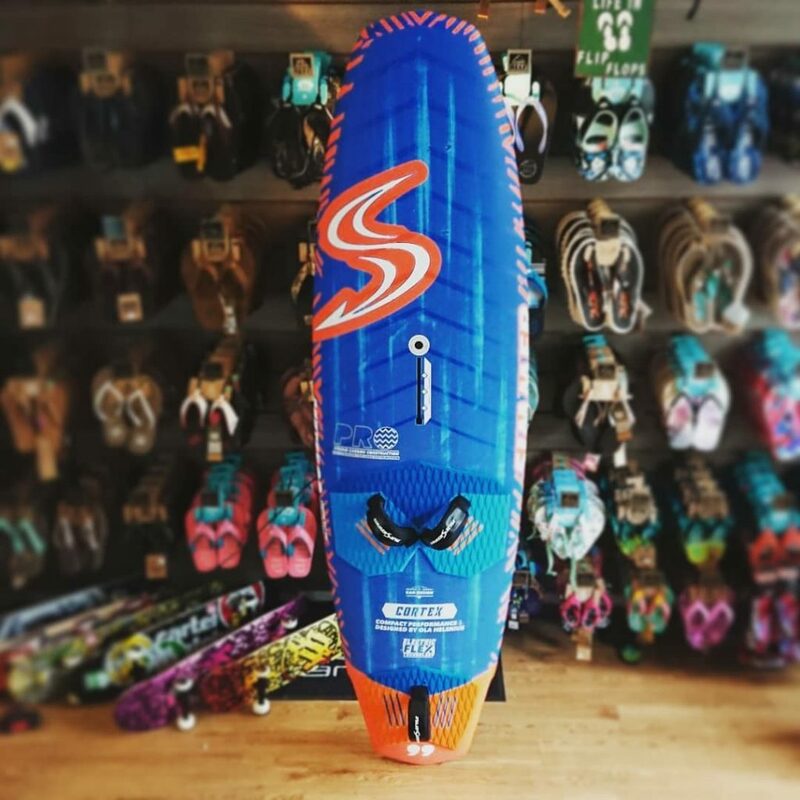 We have 20% off Simmer Flywave, Freegal and Freemove boards in most sizes, and much the same discount on sails like the Blacktip, Icon, 2XS and more. If you can’t see what you’re after then get in touch and we can see what is available for you from the Simmer range, but these deals aren’t likely to hang around so get them whilst stocks last! Mr Windsurfing TV popped by recently to hang out and gave us a glimpse of whats in the pipeline for next years boards. 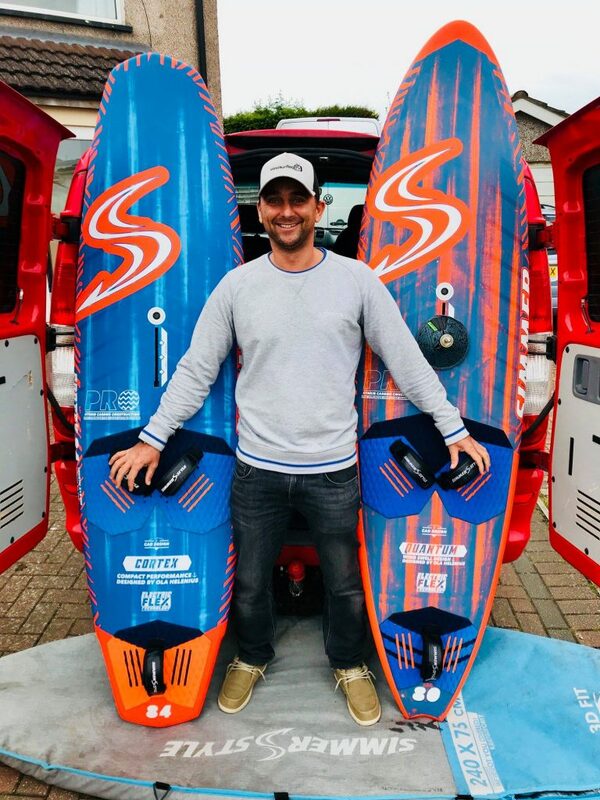 Stoked to see the new Simmer Quantum shape moving forward but lets be honest, with UK conditions we are always keen to see a new compact wave board hit the market. That is where the Cortex comes in, Simmer’s new addition to the line up. Really light and with a nice finish, these beauties are going to kick up a storm when they come to market, trust us on that one! As a mid season release, the all new super exciting JP Super Ride is available to pre-order nw to be the first in the UK to be on one! What’s more, they are all also FOIL READY, and from just £1299! Designed to be the solution many blasters were looking for, this board offers maximum performance at an accessible level, which results in maximum fun every time you step out on the water. The Super Ride is designed to sit between the Magic Ride Freeride line and Freerace Super Sport line. They offer the ease of sailing of the test winning Magic Ride, and the speed and prowess of the Super Sport. The Super Ride board is set for a bright future. The Super Ride is compact and relatively short overall and not too wide in the midsection. The center of gravity is close to the mast base, which reduces swing weight. This provides an incredibly smooth ride and gives you a lot of control. The parallel outline delivers stability when not planing. All this makes it a real pleasure to ride in all conditions. In the 2019 line the SUPER RIDE will replace the ALL RIDE and X-CITE RIDE ranges which will be cancelled. 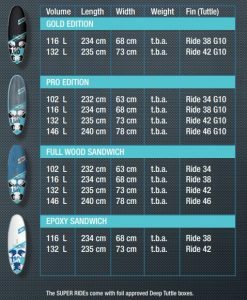 2018 Lost Boards – Pre Order Now! With Spring just around the corner (so we’ve been told…. ), it is time to make reality of those distant Winter dreams – Warmer weather, warmer water, light evenings and Summer swells! The Lost Puddle Jumper is possibly our (and everyone else’s for that matter) favourite Summer groveller for mellower conditions. 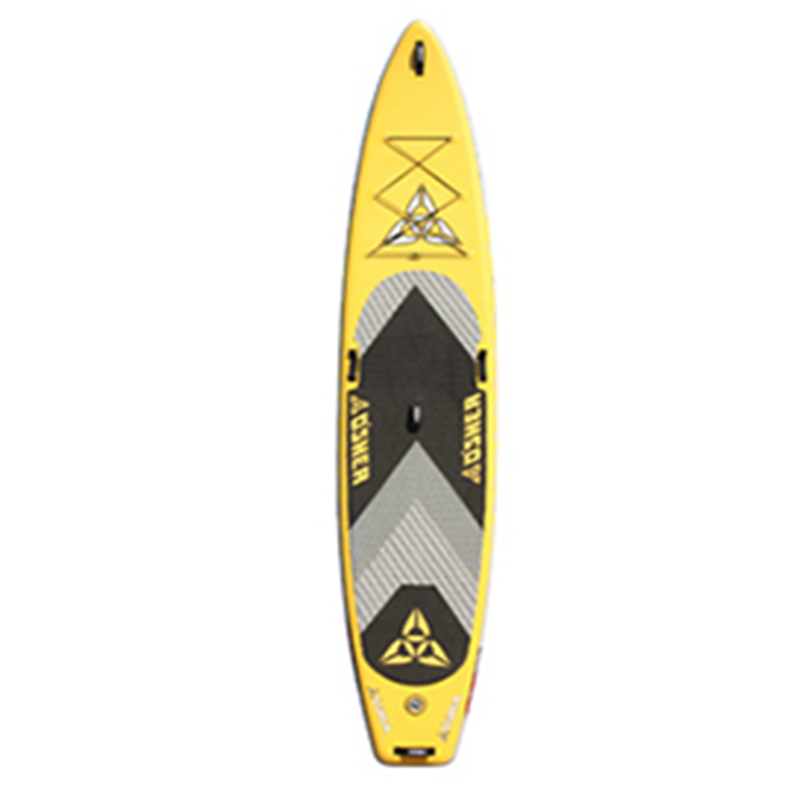 It is the go to board if you are looking to inject more life and more waves into your Summer sessions. Good width and flat rockers turn it into a right little rocket ship, but with volumes high for their lengths, you can step down 4-6″ from your normal length injecting a huge amount of explosiveness into your riding in waves that you would normally question going out in! What Lost have also done, is improve their design further by introducing it in the super light and strong Carbon wrap construction – the best just got better! Check out the full details here, along with other shapes/constructions we have available from Lost such as the Round nose fish, sub buggy, short round and more, and get in touch to Pre-Order yours now!